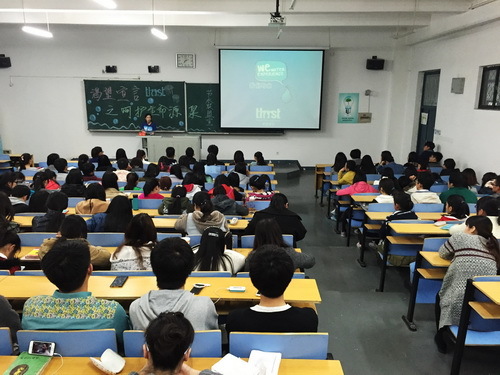 To celebrate the World Water Day (March 22, 2015), Guanghui E, the president of the Young Volunteer Association of Hebei Normal University organized a Water Dragon event together with Thirst. The activity involved a large group of students and also teachers from all departments. Water dragon is one of Thirst’s trademark activity. Thirst staff will draw the dragon well in advance. Then, with the help of volunteers guide the students into dragon formation. Once the Dragon is formed a photo is captured from a high vantage point. The Dragon event takes approximately an hour. The water dragon represents the joint effort of Chinese Youth to demonstrate they care about China’s future and the water crisis. So far Thirst has successfully created 8 water dragons in schools in Dalian, Beijing and Shanghai, also received a Guinness World Record with the largest human dragon consisted of 1,973 participants and was achieved by Thirst and National Institute of Technology (NIT)- in Beijing- on 6 November 2013. During the event students are interviewed (for our event video, and for their own student newspapers and media) and participate in activities. Our Thirst education team had a very early start and traveled for 2 hours by train, from Beijing to Hebei province, in order to arrive at Hebei Normal University for 8am. On arrival they met with a lovely group of students who kindly helped to organize the Water Dragon participants and helped guide them around the university for the day.We had a test run of the human dragon at around 2pm, and successfully executed the final water dragon (consisting of around 300 Students) at 4PM – which looked incredible! We had a great time with the students and everyone really enjoyed themselves –congratulations, this was our first Water Dragon of 2015. Zhangyu from the Thirst club team then delivered our ‘We Water Experience’ Presentation on the key issues surrounding the problem of water scarcity, Including; the hydrological cycle, the facts on water pollution, figures regarding our water footprint and the concept of‘Invisible Water’ (These are water consumption facts that we would not usually think about, i.e. it takes 4,500 litres of water to produce a 300 gram beef steak!). Students who were once confused or unaware about these concepts had their eyes opened to the facts on these issues, inspiring the audience to adopt water-wise habits into their daily lives. As the co-organizer of the activity, we at Thirst would like to take this opportunity to personally thank everyone that was involved at Hebei Normal University for their outstanding efforts and overall support with this amazing project – You are all Water Heroes! If you are interested in getting involved with our cause and perhaps organizing a water dragon event at your school, please contact us by email, we are eager to help. info@thirst4water.org.